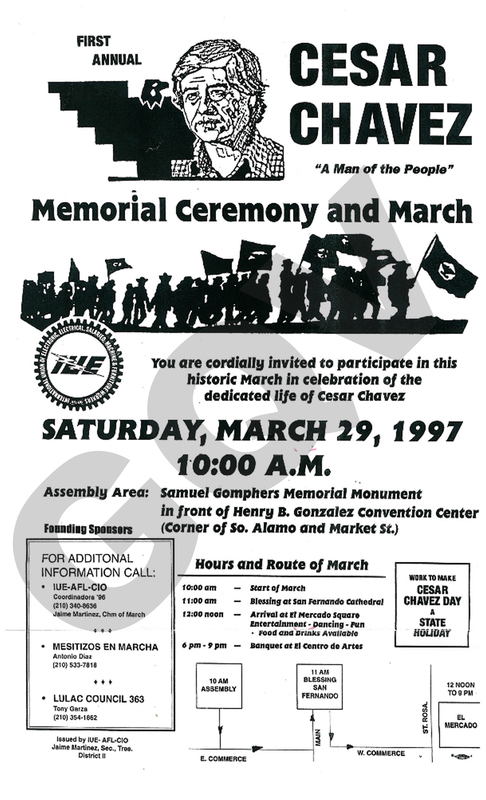 The San Antonio Cesar Chavez March for Justice was founded in the fall of 1996 by the three leaders from two organizations: Jaime Martinez of Coordinadora 2000/96, Tony Garza of Lulac Council 363, and Antonio Diaz of Mesitizos en Marcha. La Marcha, was a direct response to California Proposition 187 legislation that proposed to deny undocumented immigrants access to health care and education. 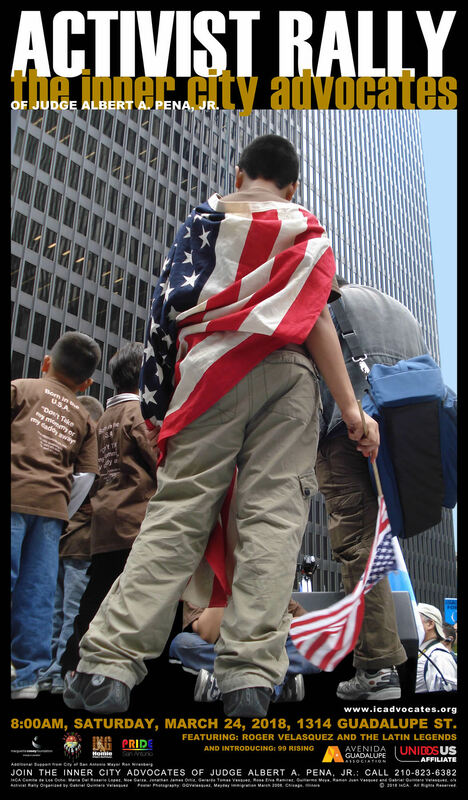 Coordinadora 2000/96 was an ad-hoc national committee organizing an October 10 Latino march in Washington DC. In San Antonio, Coordinadora was represented by a coalition of community leaders from many organizations and individual citizens who came together to address common issues that impacted the community. Returning from D.C., the coalition felt that César E. Chávez was an American hero worth remembering, setting four goals in 1997: to name a major city street after Chávez, have a yearly memorial march, achieve a Texas state holiday, and start a scholarship fund. Jaime P. Martinez championed the March for Justice with Garza and Diaz, various MEChA university and college chapters mobilized the street renaming effort, and Martha Von-Ellenrieder founded the Cesar Chavez Scholarship Fund with her husband Roberto, Carlos and Jenny Murguia, Johnny Zepeda and Rey Villanueva. 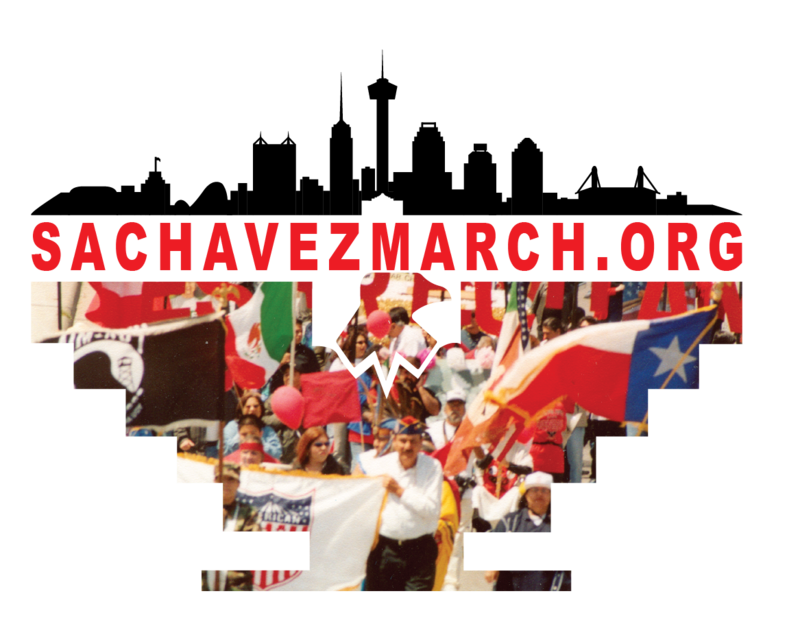 In 1997, the San Antonio César Chávez March for Justice commenced organized by the newly formed Cesar Chavez Committee. The official organizing location was Estella’s Mexican Restaurant on Martin Street. In 1999 Albert A. Pena and the Inner-City Advocates, under the direction of Gabriel Quintero Velasquez, joined the organizing effort taking over coordination of march logistics, event management, and co-chairing the general organizing effort. In September of that year the City of San Antonio authorized the Annual Parade as an Official Event of the City of San Antonio, providing for funding of the march, while also displaying the honorary designation of Commerce Street as “Cesar Chavez Memorial Way”. Mayor Howard Peak is credited with first offering Durango Street to carry Chavez’s namesake. San Antonio District 5 City Councilman and Harlandale High School graduate Rick Vasquez is credited with circulating the Six Signature Memorandum on dated July 23, 1999 bringing the street designation and funding item to Council’s agenda. Then District 6 Councilman Jose Menendez (now State Senator) played a strong role in moving the measure to ordinance. In the year 2000 (4th Annual CCMJ), Avenida Guadalupe Association began sponsoring la marcha’s start-point at Plaza Guadalupe while Velasquez negotiated the termination point to be Alamo Plaza, marking the route that the march would continue until 2017 when the Alamo Master Plan Project commenced. On Thursday, May 19, 2011, the San Antonio City Council approved changing the name of Durango Boulevard in honor of civil rights activist and labor leader Cesar E. Chavez at a cost of $99,853.00. Noting the lack of City action since early 1999 Cesar Chavez Committee efforts, Councilman Philip Cortez filed the paperwork that began street renaming process of changing Durango Street to Cesar E. Chavez Boulevard. Cortez shortly thereafter left office having termed out. City of San Antonio Councilpersons, Mary Alice Cisneros, David Medina, Ray Lopez, and Justin Rodriguez’s signatures are borne on Cortez’s “council consideration request”. Chavez Boulevard is a 5.4-mile stretch east to west. In many ways, 2017 marks an end of an era. The Historic and Official Cesar Chavez Committee proudly holds its legacy with that of its founder’s as a testament to its commitment in the course of the past 20 plus years, completing its mission without incident, and delivering to the City of San Antonio and its citizens a peaceful and well organized march: a good record of activism dedicated totally to the non-violent struggle for social justice. © 2018 SACHAVEZMARCH.ORG. All rights reserved.